“The people of this world are like the three butterflies in front of a candle’s flame. The first one went closer and said, ‘I know about love’. This is the kind of Sufi wisdom that Khemir tries to convey in his tale of an aged and blind Sufi dervish (different from the red-headed one), who travels across the desert sands with his young granddaughter in search of an epic gathering of Sufi practitioners said to take place once every thirty years. One might assume that such a journey through a picturesque landscape would provide a compelling narrative backbone of the tale we are watching. But this is not the case, and it points to the narrative shortcomings of the film. In fact that blind man’s journey is only a vehicle to relate four other stories that are told piecemeal and concurrently by various participants in the pilgrimage. Each of these stories is apparently supposed to reveal another side of the inscrutable Sufi way. In pursuit of his expressed goal of presenting the mystery of Sufism, Khemir injected into the film’s dialogue poems and phrases drawn from ancient Sufi masters Rumi, Attar , Ibn Arabi, and Ibn Farid. Khemir also seems to have recruited a remarkably broad international team of Middle Eastern and European production and post-production collaborators, including contributions from Michelangelo Antonioni’s longtime screenplay collaborator, Tonino Guerra (L'Avventura, La Notte, L'Eclisse, Red Desert, Blow-Up, Zabriskie Point). 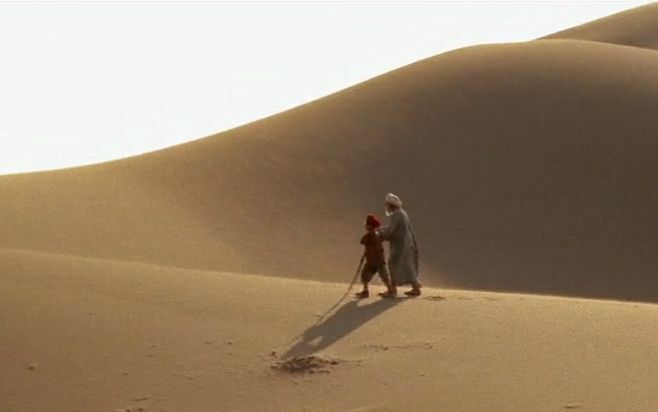 The story begins with the aged dervish, Bab’Aziz, and his 10-year-old granddaughter, Ishtar, managing to survive a fierce desert sandstorm and then resuming their trek across a vast, horizon-to-horizon desert of sand – the kind of desert image from your childhood dreams or from illustrations of the tales of the “Arabian Nights”. Such an evocative landscape signals to us that we are in for a tale of mystery and magic, parables and fables. In fact the setting seems so primitive and eternal that we feel that events must be taking place somewhere back in medieval times, although later on in the film there are occasional appearances of motorcycles, buses, and jet planes to remind us that the film’s actual setting is the present day. Bab’Aziz’s tale: “The Prince Who Contemplated His Soul”. Osman’s tale about his visions when he fell into a well. Zaid’s tale about the psalmody contest. Hassan’s tale about his twin brother. Although each tale is beautifully photographed, and the viewer is enticed to follow along and piece the story fragments together, none of them really lives up to its promise as the visually poetic allegory that seems to have been suggested and that one hopes for. 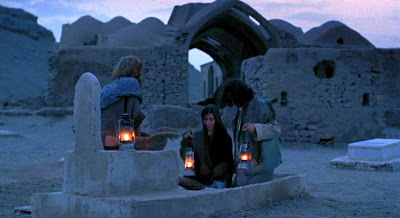 The story that Bab’Aziz tells to Ishtar occupies a fair amount of screen time to tell, but there is not really much to the story. The handsome young prince is distracted from watching a performance of a dancing girl at his desert camp by the sight of a gazelle in the distance. Fascinated, the prince wanders out in search of the gazelle and does not return. After a lengthy search the prince is discovered sitting by a small pool and gazing as if in a trance at his reflection in the water. We are told that he is not admiring his image, but is in a meditative state, contemplating his own soul. At the end of this tale, the prince eventually wakes up from his revery and decides to abandon his royal estate and become a wandering dervish (leading some to speculate that this tale is really about Bab’Aziz’s own past). Osman, who is said to work as a “sand carrier”, is first encountered when he is rescued from having fallen into a public well. Afterwards, he tells how he came to fall into the well (he was fleeing a jealous husband) and what he saw at the bottom of the well (a palace full of beautiful women, including his beloved). His story if the oft-told tale of the man who cannot regain his lost paradise. Zaid is an educated young man wearing a baseball cap whom Bab’Aziz and Ishtar encounter along the way, too. He tells his story about his participation in a master psalmody, or poetry-singing, competition. 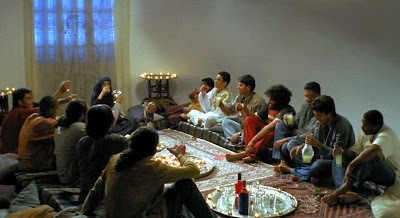 Zaid and the other contestants take turns singing out beautiful poetic phrases, and they are judged by a mysterious young woman, Nour (played by the mesmerisingly beautiful Golshifteh Farahani, who has also appeared in Boutique (2003), Half Moon (Niwemang, 2006), and Ali Santouri (Santoori, 2007). Zaid’s poetic rendering wins both the competition and the heart of Nour. But after a passionate encounter, she ultimately steals his clothing and disappears so she can go out in disguise and search for her lost father. This story seems like Osman’s tale of loss, but it has a happier conclusion. Hassan’s story is the most mysterious and is even more fragmented than the others. He is first seen searching for a red dervish who, he says, murdered his twin brother, Hussein. Hassan is also seen briefly in Osman’s tale, where he is revealed to be a drunken libertine, the very opposite of his authentic and serious-minded brother. After some misadventures, Hassan eventually does happen onto the red dervish, and we even get a brief glimpse of the red dervish’s role in Hussein’s mysterious entry into the nether world of death. There is much (a ctually too much) left unsaid here, and Hassan’s own conversion into the dervish way of life is equally unmotivated. Overall, I might say that Bab’Aziz - The Prince Who Contemplated His Soul is a film marked by pronounced strengths and weaknesses. On the positive side, one must acknowledge that the cinematography and some of the production values of the film are extraordinarily good. Veteran cinematographer Mahmoud Kalari, who has worked with many top Iranian filmmakers, presents a string of fantastic (and phantasmagoric) images of a dreamlike desert setting. It is my understanding that the filming in the desert was extremely difficult and that most of those desert camera setups could only be used once because of the unerasable tracks made by the actors in the pristine desert sand . (This difficulty probably accounts for some of the awkward editing sequences, where visual continuity and orientation are sometimes not maintained.) 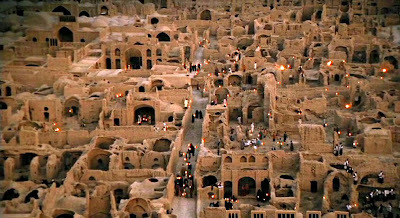 Another visual treat, near the of the film, is the view of the appointed place for the Sufi gathering, which was shot in the historic Iranian city of Bam. 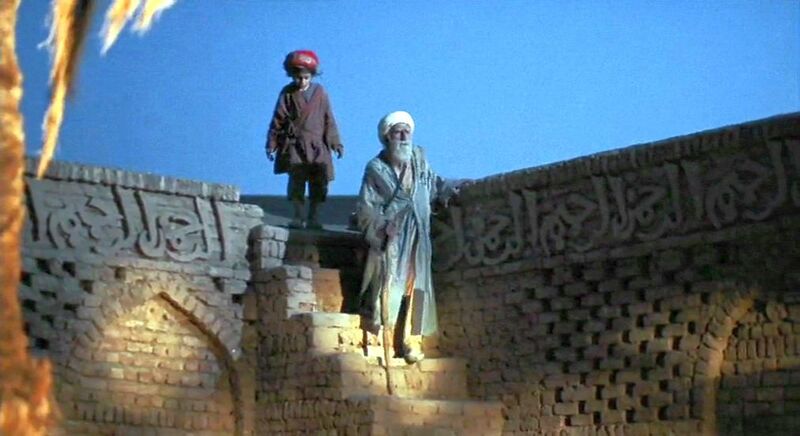 Bam has a 2,000-year-old history dating back to the Parthian Empire, but many of its historic monuments were damaged by an earthquake in 2003, which occurred shortly after the Bab’Aziz filming was undertaken there. Unfortunately, the virtues of the cinematography cannot make up for the serious narrative deficiencies in Bab’Aziz. None of the four told tales has a narrative aim or motivation. One could, I suppose, make the counterargument that these stories are supposed to be somewhat mysterious, but the fundamental problem is they are not sufficiently engaging. As a consequence, the viewer’s mind might wander, even in the midst of all that visual splendour. There is one further positive aspect, though, that it worth mentioning. Although the film is mostly of men and about men, the women who appear in the film (very modestly attired) are memorably graceful and sonorous (yes, there is some singing). Of particular note are the enchanting Golshifteh Farahani, as Nour, and the namaki Maryam Hamid, as Ishtar. Chale Nafus, “Bab’aziz – the Prince Who Contemplated His Soul”, Austin Film Society, Austin, TX, USA, 2009, http://www.austinfilm.org/Page.aspx?pid=929. Thanks for your comment, Olivia. I would appreciate it if you could list some of the symbolic indicators that I missed.